I move from writing about one lady with a Morrissey connection (Sandie Shaw) to another. In 2004, Nancy Sinatra recorded Morrissey’s “Let Me Kiss You” accompanied by the man himself on backing vocals. 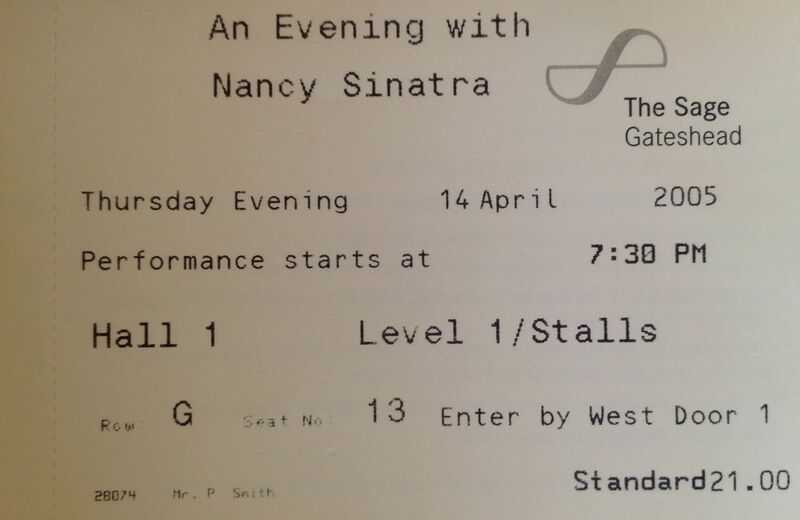 She also came to the UK for a tour shortly afterwards, and Marie and I went to see her at The Sage Gateshead. Support was Richard Hawley, who also came on stage during Nancy’s set and dueted with her: “working with Nancy came about because Jarvis was asked to write some songs for her…..he called me and wondered if I would like to come along to co-produce and play on them…..she asked me to support her on her European tour as a solo artist which I enjoyed immensely. She also asked me to get up with her band and duet with her every night, which is a memory I will cherish for all my time” (Richard Hawley, from his website). 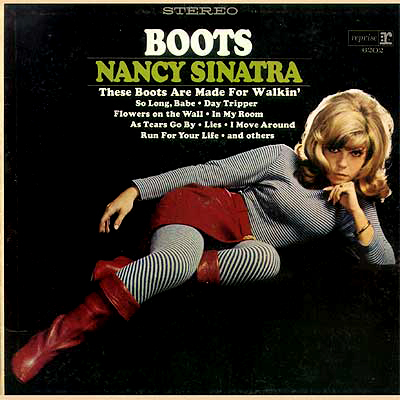 I have several of Nancy Sinatra’s albums from the 60s; the albums “Boots”, “Movin’ with Nancy” and her lp with Lee Hazlewood, “Nancy and Lee” are all just great. “These Boots are made for Walkin'” is a classic pop song and “Summer Wine” and “Some Velvet Morning” are beautiful, dark, strange songs. So I was quite excited about seeing her. Well the lady didn’t let me down; she was pure class and sang many of those classics: “Boots”, her excellent version of “Bang Bang” which is so much better than Cher’s version with that spooky reverb guitar, “You Only Live Twice”, Morrissey’s “Let Me Kiss You”, a great and emotional duet with a video of her dad on “Somethin’ Stupid” and The Beatles “Run for your Live” which she covers on one of her 60s albums (I think it is on “Boots”). 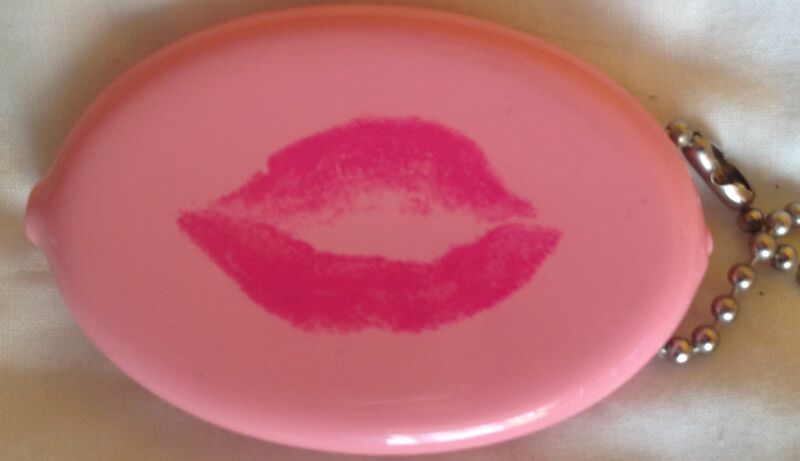 At one point she walked up and down the aisles throwing out Nancy key rings, each one in the shape of a big puckered pair of pink lips (I managed to catch one 🙂 see the images). Just great, and for me a dream come true. I think she also sang “Sugartown”, another great track. I guess this is another guilty pleasure, but actually I think the lady is one of the true greats, and don’t care. Here is the setlist from the London show of the same tour; I would guess the set at Newcastle will have been similar to this, although not exactly the same, as I am sure she sang “Run For Your Life” at the Newcastle concert: Bang Bang; Your Groovy Self; How Does That Grab You, Darlin’? ; Barricades And Brickwalls; Baby Please Don’t Go; Let Me Kiss You; Easy Evil; Drummer Man; 99 Miles From L.A.; Sixty Minute Man; Flowers; Two Shots Of Happy, One Shot Of Sad; Somethin’ Stupid; Tony Rome; Baby’s Comin’ Back to Me; Lightning’s Girl; Sugar Town; These Boots Are Made For Walkin’. Encores: You Only Live Twice; Don’t Let Him Waste Your Time; Friday’s Child; So Long Babe; Besamè Mucho; 100 Years.